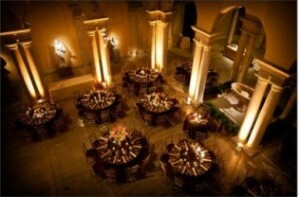 Lighting is often an overlooked aspect when it comes to planning any occasion. 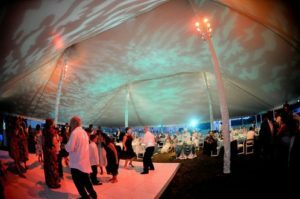 Event Dynamics will show you how our lighting techniques can transform any location into a special atmosphere and create an unforgettable ambiance that will bring your event to life. Check out a few techniques below and you can always check out more examples in our portfolio! This is a technique where lights are placed on the ground and aimed upwards to project light either onto a wall or at a specific object. It’s a useful way of highlighting certain decorations, parts of the room, speakers during a presentation, or other elements. Even if nothing specific is being highlighted, up lighting can be used to create a wash of colour over an area that can be put to a number of decorative or creative uses. You can check out more examples in our portfolio! 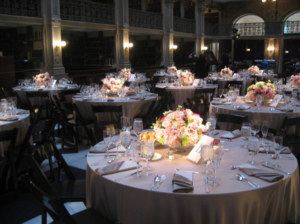 Pin spots are focused beams of warm white light, projected onto tabletop focal points, such as centerpieces, wedding cakes, artwork, and auction items. Pin spots highlight these elements, making them stand out in photographs and in person. You can check out more examples in our portfolio! 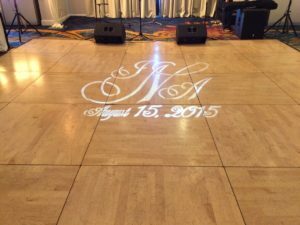 A gobo is a type of stencil that gets placed over a light source. As the light passes through the gobo, the stenciled image gets projected onto whatever surface it’s pointed at. Gobos are popular for the sheer level of imagination they can enable. Common uses include things like projecting a company logo or a bride-and-groom’s monograph, but they can also be used to craft enchanting scenes and images. They are great for adding texture onto a surface as well. You can check out more examples in our portfolio! 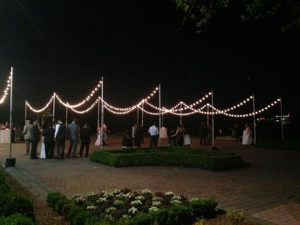 If your event is held outdoors, lighting options are still available to create a dynamic atmosphere. 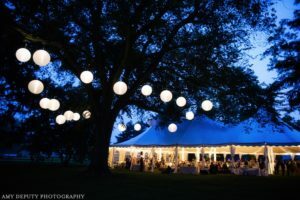 Chinese lanterns can be strung to evoke a dreamlike aura while maintaining a light and fun mood, while string or bistro lights can be used to draft a canopy over a dance floor or dinner area. You can check out more examples in our portfolio!